We have many Native American shamanic medicine rattles from different traditions to choose from, from Hopi, to Cree, to Maidu. Also, we have a large selection of Peruvian shamanic medicine rattles, as well as Egyptian and African shamanic medicine rattles. 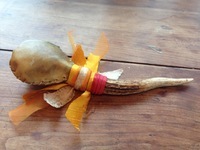 All of the rattles we have available here are chosen because of the quality of their voice and medicine. Rattles and shakers are a great tool for musical entertainment and relaxation, and have historically been used world over for sacred ceremonies and rituals. We are honored to work with many great artisans of these fine tools and to bring a great collections of rattles to enjoy. We enjoy all of the rattles in this collection, but do note the power of the Bear, Buffalo, Moose and Elk Medicine Rattles, the beauty and pristine quality of voice in the Hand Painted Native American Rattles, the joy of the Peruvian Medicine Rattles, the medicine of the Intention Rattles, the ease and versatility of the Cowrie Shell Medicine Rattle and the harmony of the Harmonic Rattles.